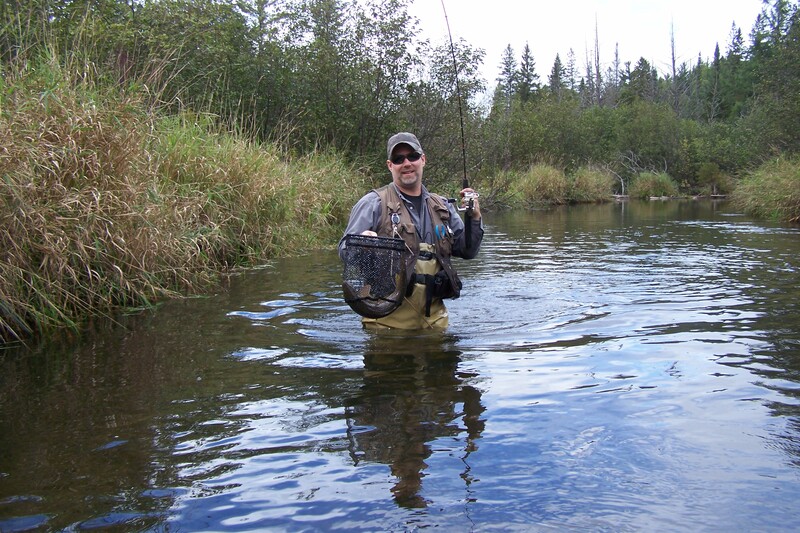 If there’s a story about trout closer 2018 it’s that we needed cold weather to get fish moving up the trout streams and it happened, at least on the Pigeon River. Feral and I fished the Sturgeon twice, saw one brown trout about 18 inches and a couple small ones and that was it. Feral was so discouraged he went bird hunting (partridge) for a good part of the closer. Lots of long walks with a vintage Montgomery Wards 20 gauge pump he picked up somewhere for two and a quarter. He was determined to add a couple birds to our annual trout dinner. 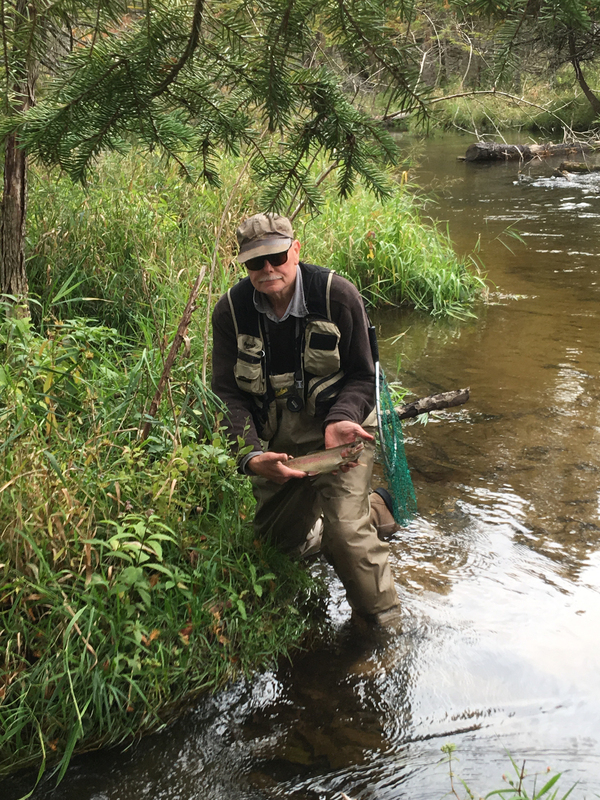 Didn’t work, scarce birds, but fortunately Natch and I went over to the Pigeon River where we found some pretty good fishing. First trip, funny story. Natch and I were on a sandy stretch of the Pigeon and he caught a nice brown about 16 inches. I took the lead and caught one 19 inches. He took the lead and stopped at a pool too deep to wade and told me to make a few cast with my lure figuring maybe a trout might like what I was throwing. 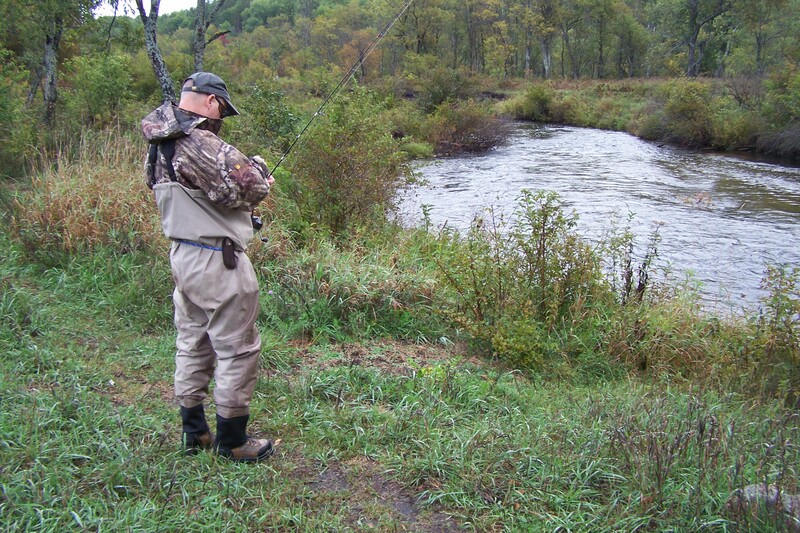 So, standing behind me, he made a long cast back downstream to where we had just fished. See the photo above. 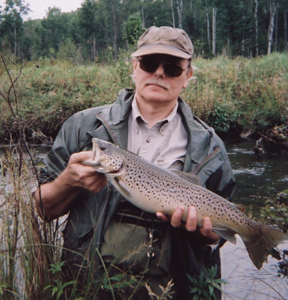 21 inch male hook-jawed brown. Now that I think about it, that story isn’t so funny. Two days later I caught another brown about 19 inches on a different stretch of the Pigeon and Natch pulled out another 21 incher. That’s a disturbing trend. Denny came up for one night. We were happy to see him. That was last Friday and it started raining that evening about the time we started thinking campfire for warmth. I had pitched a screen tent in case of rain so we set up lawn chairs in there and drank beer to get warm. Natch brought some home brew whiskey kind of thing which I tried and liked but held off. Natch is ten years younger and has an iron stomach. I am usually surprised by the variety of things he can mix down there. Denny headed home Saturday. I think he’s been too accustomed to camping in a heated trailer with Mike, our departed and missed brother. I fished a second stretch of the Pigeon with Natch on Saturday. We jumped in the river off the Shingle Mill pathway and fished upstream to the Elk Hill Equestrian Campground. It was a long and treacherous journey that produced a couple fish (my second 19 incher) but it was brutal walk back to the car across low ground with tight saplings and heavy grass, and a hill made for mountain climbers. If we ever try that again we will be spotting a car at the campground. Lesson learned. On Sunday Feral said he was bird hunting again so Natch and I decided to fish another stretch together. So far we had been catching plenty of fish and there was one more section of the Pigeon we were thinking about, with some dread. Downstream from Tin Bridge. There’s no fisherman’s path along the river. 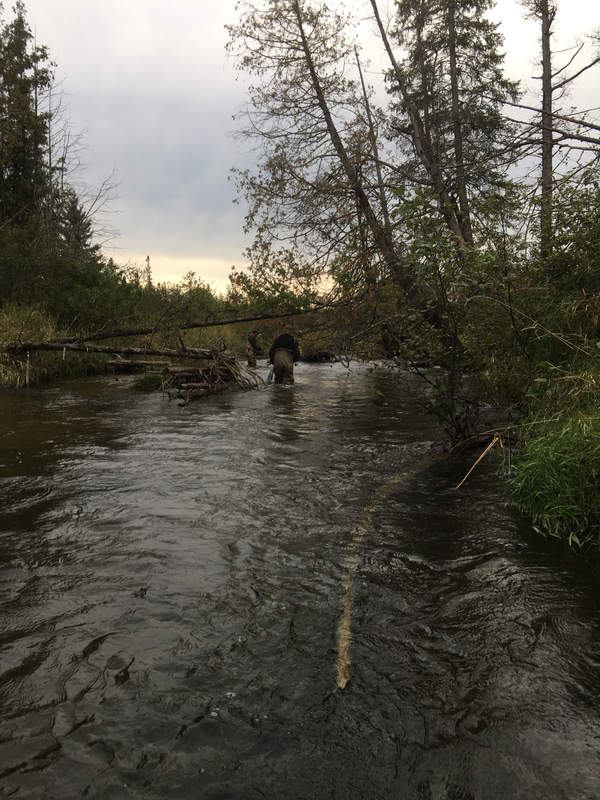 You bust your way through saplings and pines and tall grass that hides stumps designed to trip you up or put holes in your waders. The grass is waist deep and woven so tight you tear grass when walking through it. By the time we made it downstream to a bend that looked promising we had to drink half a bottle of water and eat a nut trail mix snack just to see straight. Natch spent part of the walk in figuring out how to get me out if I were to have a heart attack. The answer: tie two logs together and lay me on top, push me off, and hope I float down to the next campground. No real chance of me making it but I appreciate the thought. Seriously, if you get hurt back in there it’s time to make peace with the world. We hadn’t fished but one or two bends before Natch hooked up with another decent fish. It came from under a grassy bank. From then on I was determined to catch something over 21 but it never happened. I did catch a nice rainbow, about 16 inches. 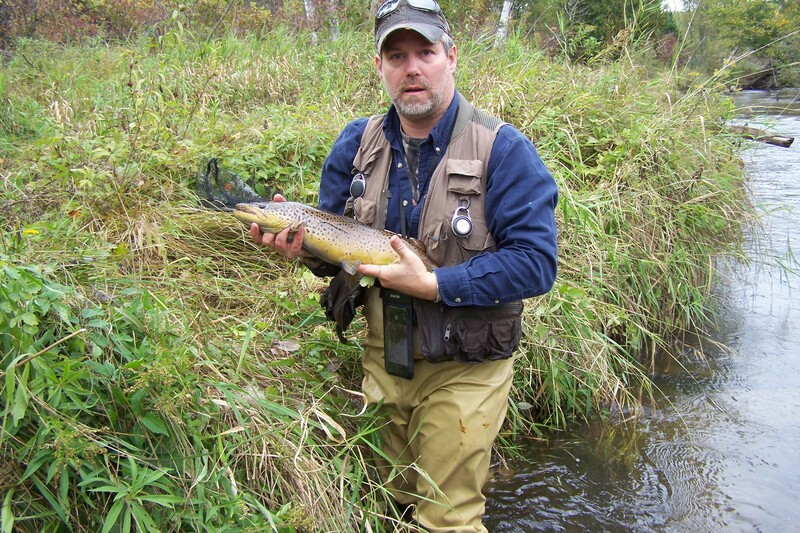 It was surprising because brown trout seem to take over and dominate streams. 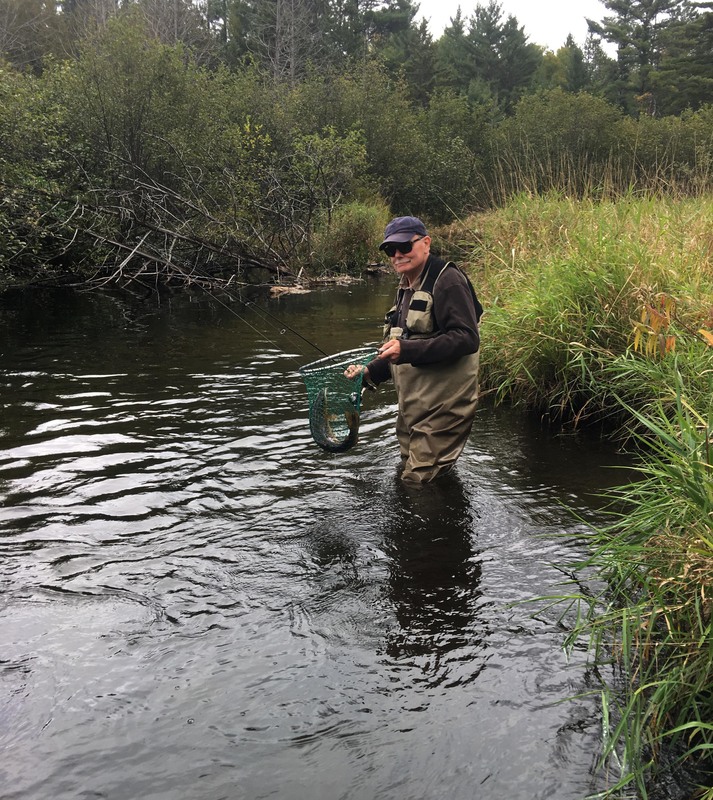 I should mention while Natch and I fished Tin Bridge, Feral fished the Pigeon where it crosses Sturgeon Valley Road and pulled out a 16 inch brook trout. So there you go, exceptions to the rule. Natch and I were gone so long Feral decided to drive over to Tin Bridge and look for us. We were a couple hundred yards downstream of the bridge when I heard a whistle. Knew right off it was Feral. He joined us and took the lead. Natch stayed back and took some photos. I was hoping to see Feral catch a really good brown – this was it, the end of the season, last stretch. Didn’t happen but the closer was everything we could have imagined. 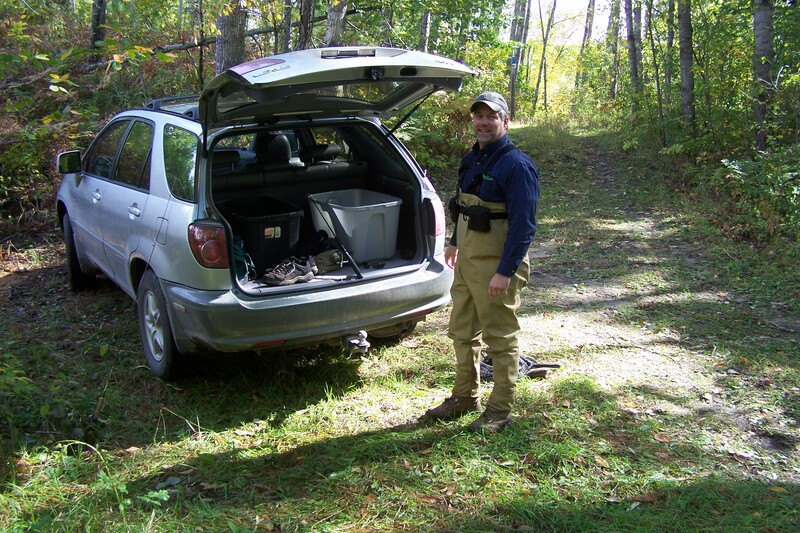 Productive fishing, some great campfires (Natch brought a chainsaw), a fish dinner cooked up with cajun fish mix, beer, fall colors getting traction. Good conversation, lots of humor. Doesn’t get any better.